OnBoard is the award-winning magazine and newsletter of Bluewater Yacht Sales (and previously Jarrett Bay Yacht Sales). 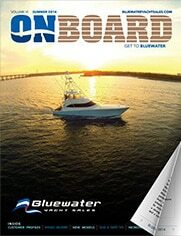 OnBoard is a complimentary publication produced by Bluewater Yacht Sales for our customers, prospects and associates. In the issues of our magazines and monthly newsletters you can find information pertaining to all of our new boat brands, service facilities, affiliates and customers.